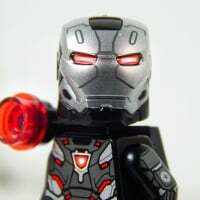 Is TLG doing anything about all the fake minifigures on Ebay, Etsy and Amazon? All those platforms have a way of reporting listings but when it comes to IP issues it needs to be done by the IP owner. If TLG really wanted they could quickly wipe out the fakes. I've heard eBay can be quite difficult when it comes to dealing with "technically-not-lying" scams. I guess they make money off every listing. I know that marketplaces won't do anything unless they're sued or something. There's a program called Vero that brands use to protect their intellectual property. I'm surprised that TLG isn't using it in an effective way. I had a listing removed few years ago for using a common word that also happens to be a trademark. It's owner didn't like the fact that it was used in relation to something they don't make and got eBay to take my listing down. TLG, Disney and other brands ripped off by those fake minifigure sellers could and should do something similar. 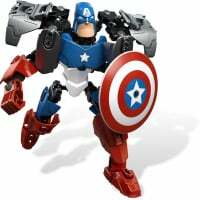 It reminds me of an absurd case a few years back where Hasbro attempted to sue the mother of a little boy for having the online username "RoboDino" or something. If they can pull that off, I'm sure Lego can enforce their own damn patent. Bring up pineapple on pizza and you'll polarise Australia too. there's an idea. i might contact Lego and see if i can convince them to make a pizza piece with both pineapple and anchovies on it. Yum. Pineapple is fine as long as @xiahna isn't having any, she's allergic. I've never understood pineapple on pizza, yet that's all my kids want. I have to order a separate pizza for me. I'm pretty sure anything sweet could have made it to pizza with some success. Personally, a white pizza with every vegetable and banana peppers is my preference. Or the chinese fake version of noodles, water chestnuts and pak choi pizza. None of these words go together or make sense. History books should come with plastic toys, apparently. But I guess in the US they probably also have "alternative history" books. History is written by the victors! Oh, and the mentioned plastic toys in those "alternative history" books would likely made by Lepin. ...And this is why I shut off CNN or Fox News and browse a website about LEGO. Maybe we can start a Brexit thread and see how quickly I can take a nap. Or maybe a Trump Brexit thread, and then break the internet on two continents. And don't mention Sauerkraut (or the war - and who started it), or I'll be REALLY offended! This is no joke by the way, we have some in the freezer right now. About a quadrillion calories, but very tasty. It offends me more than Lepin made their own version of Market Street. 70p or so each delivered. I'm in for "a couple". Now I am just waiting for a decent Witch King helmet. And while I am at it, why can't LEGO print on the backs of the legs, or get print to match across the hips? When the Chinese cloners stick the legs to the torso first then print, I wonder why LEGO still has the ugly break in print across the waistline, with lines often not matching up. 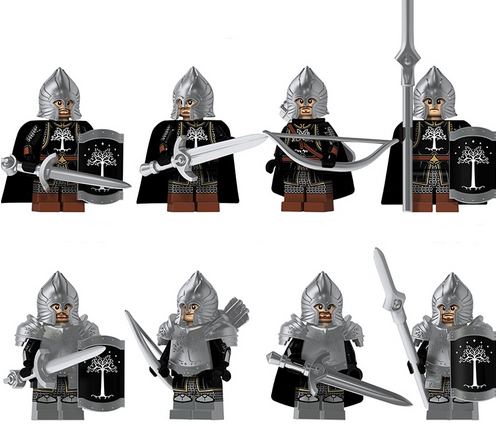 I already have a Gondor army, based on the Heroic Knight CMF. My excuse to myself for buying these ones is that I will just use them for the helmets and shields. I use brickforge and brickwarriors parts too, so using parts from a Chinese clone brand isn't going to hurt. Although if the figure parts are OK, I'll probably use them too. If the print is anything like the recent POGO and Decool ones, it will be better than LEGO's anyway. "If the print is anything like the recent POGO and Decool ones, it will be better than LEGO's anyway." That may be the saddest commentary in this thread - that the counterfeiters are better at Lego than Lego is, at least when it comes to printing. Yeah, cloners have really improved whereas LEGO has pretty much stood still in comparison. Lego have made some small steps - more detail, side leg printing, arm printing, etc but the cloners have definitely moved faster. 3-4 years ago their print quality was crap, so bad you might as well have just drawn lines with a sharpie instead. But now, the cloners are producing some excellent figures. Cloners implies copying something. But they're also doing original stuff - the DC Comics lanterns come to mind. A reminder that the Lord of the Rings theme, despite some excellent sets, still had a lot of wasted potential. Well, they are cloning the minifig, a protected trademark. And infringe the IP of the rightholder. Hardly original. Sorry, you're totally right. I thought the patent on the minifig was already over, since the minifig is 40 years old. But I've now read how LEGO was able to protect it's trademark. They are also often copying the designs of customisers too. 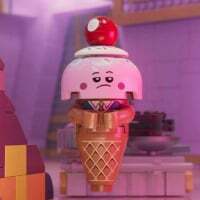 But £40-50 for a custom print on Lego parts vs the same or a very similar design on fake minifig parts for about 70p and I know what I will buy, especially for army building. I’ve never had any interest in actually purchasing Chinese knock offs, but was tired of seeing wish come up in my Facebook feed, so downloaded the app & started scrolling. A friend of ours does use it, and as you might guess, unlike dealing with LEGO, has less than a satisfactory experience. But it was really disturbing. I’m not sure if it’s Wish and how they market, but half the knockoff sets it seems have “regular” prices inflated above actual MSRP, to show ridiculous discounts. But their ‘sale’ prices were no better than what I can find searching for actual ‘real’ LEGO on sale! I noticed this with #42078 and #70620 as ‘large’ sets, but also oddly #41323 (perhaps because it’s recently discontinued). I feel bad for anybody that doesn’t realize they’re paying just as much for an inferior knockoff, when they could have the actual thing for hte same price with a bit of searching. Wish is just overpriced conterfeit fraud central. They even poorly copy and falsely market as-seen-on-TV products. Amazon should take it's greedy monopolizing fingers and use them to crush that disgusting garbage dump for once. Have to agree based on my first review. No thanks. Overpriced indeed! When they’re peddling counterfeits for the same price as I can buy real products for, well money is better spent elsewhere. With Amazon so prevalent, I’m surprised Wish even gets an audience. They certainly make products look attractive enough, but from what I see the headaches aren’t worth it, even if you discount the whole fraud thing. Saw this beauty walking around Sofia today. 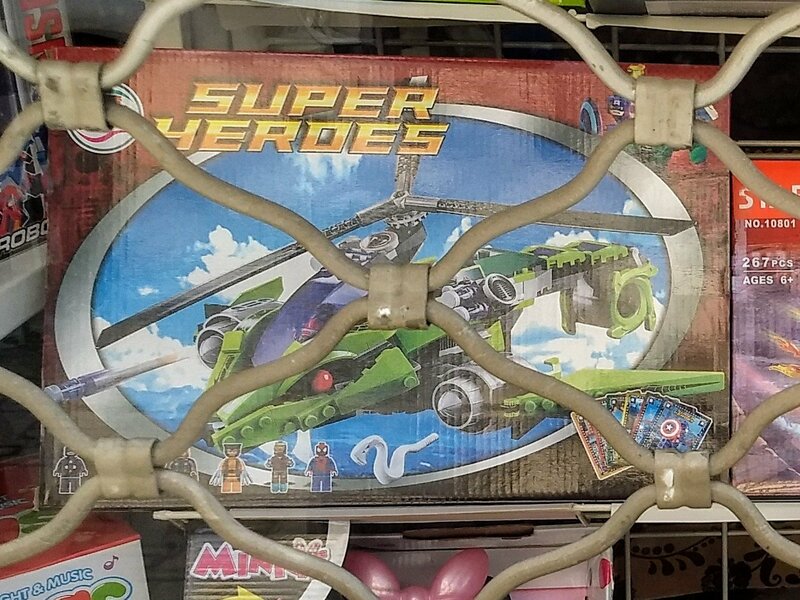 Who knew so many marvel characters and one pale snake liked to ride around in a Ninjago copter? Wow! That is to funny! Oh look there's bars protecting that garbage. What's next, high security dumpsters? Just found these on Ebay. Obvious knockoffs, but unique Ultra Agents inspired designs? The bottom one is actually pretty slick. Has anyone else’s Walmart’s started to look like this? Or is it just our small local one? I was hoping to find the popcorn polybag, but wasn’t expecting much. And I wasn’t disappointed. I knew they cloned anything & everything, but I hadn’t seen such large sets before on a shelf. I guess the price looks attractive relative to a LEGO police station, but... I thought it was just small dollar store type ones available here. I admit I had to google Bendy and the Ink Machine, that’s a new one on me. Granted LEGO would never do Five Nights at Freddys either for a licence, so they are doing something a bit different. But is there really that much demand for ‘cheap’ LEGO that they take up this much shelf space? I'm not sure how retail merchandising works in Canada, but shelf space (sections) at major retailers in the US market is purchased/leased by product manufacturers. I'm sure some knucklehead just put 'building' toys out on the shelves. The plan-o-gram for the LEGO section would not allow for off-brand product. You'll never see this at Target or Wal-Mart in the US. Thanks for the lesson. I’m assuming it’s not any different here with how retailing must work. You know walmart would have LEGO paying for their shelf space if they can. I’ll assume this is an isolated case with our local small walmart, but will definitely check out a supercenter when I get a chance. I’m assuming the larger centers with more frequent visits from the retail police would be better aligned with the plan. They have the knock off stuff here too, but it's at the end of the second aisle. The Lego themes (Ninjago, Superheroes, Lego Movie, City, ect) and the Friends and Disney Princess stuff is in one aisle. The Creator and Star Wars stuff is the next aisle over, with the last 1/3 of that aisle being the wierd knock off product and Megablocks. Looks more like Tron to me. That’s closer to how I’d have expected it, with the knock off stuff on it’s own part, and probably how it’s arranged in the larger supercenters as IIRC they do separate the themes over a couple aisles. I will have to go check it out in a ‘real’ walmart before long. Same thing here, heard of Kmart here getting threatened by one of TLG reps with having reduced stock over issues around the middle last year, a number of stores here & interstate, had sections of the Lego branded shelves loaded up with MegaBloks & BLOCKS Construction products (the second one seems to be one Kmart's 'our brand' cheap alternatives). That model can be a problem when they sell out of LEGO, and there is empty shelf space. Of course the store will fill shelves instead of leaving them blank. 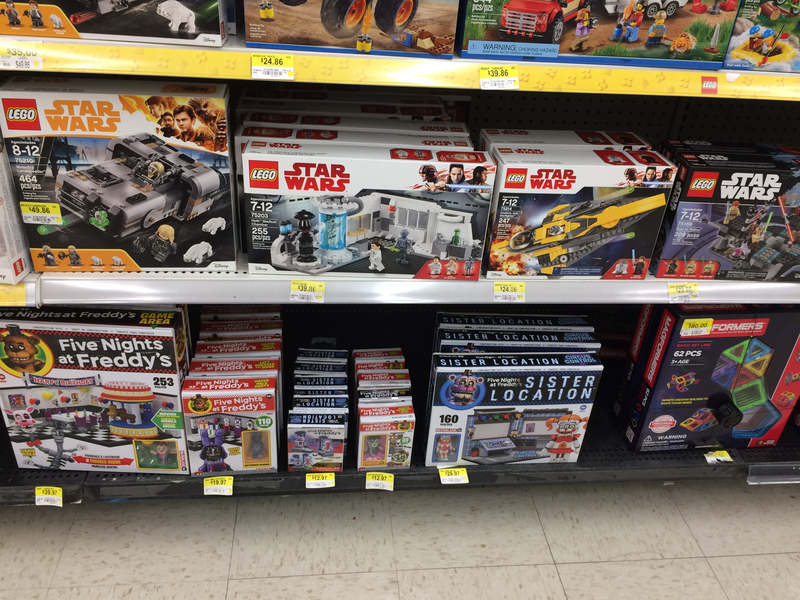 My local WalMart usually has that clone-brand crap mixed in with the LEGO- but I think it's due to apathy on the part of whoever is tasked with straightening up the aisle. Sets are very often not near the shelf price tag for that set. 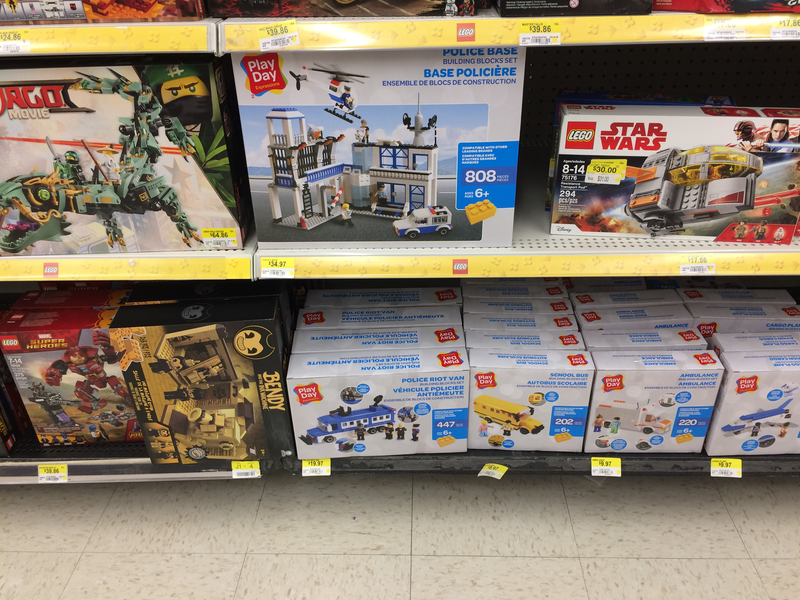 I was there last night, and they had most of the 2019 sets, but stuff was everywhere- not grouped by theme, apparently just stuck on any empty space, mostly without prices.